I made this for my sis-in-law's baby shower & it was a big hit. Here is the recipe for all those who wanted it. It comes from the America's Test Kitchen Family Cookbook. 2. Unfold thawed pastry & brush with beaten egg. Fold over edges to create a border around the tart. 3. Poke pastry with a fork & bake for 12-15 min. until just starting to brown. 4. 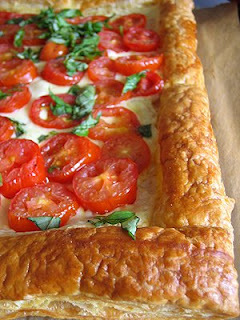 While crust is baking, slice tomatoes, salt them, & let sit for 5 min. The salt causes the tomatoes to release their juices. Pat dry before placing tomatoes onto the crust. 5. Remove crust, cut vent holes with a knife if air bubbles have formed & spread mozzarella on top. Layer tomatoes next. 6. Combine garlic with oil & brush over tomatoes. Sprinkle with parmesan & bake for 15 min. more. 7. Sprinkle with basil, cut & serve. we'll try this--our tomatoes are just ripening. Something is weird with the format of this. I can't read the end of half of the lines. Hmm . . any ideas Jess?